On the specific allegations made against the behaviour of CRU scientists, we find that their rigour and honesty as scientists are not in doubt… In addition, we do not find that their behaviour has prejudiced the balance of advice given to policy makers. In particular, we did not find any evidence of behaviour that might undermine the conclusions of the IPCC assessments. On the allegations that there was subversion of the peer review or editorial process we find no evidence to substantiate this in the three instances examined in detail. On the basis of the independent work we commissioned (see Appendix 5) on the nature of peer review, we conclude that it is not uncommon for strongly opposed and robustly expressed positions to be taken up in heavily contested areas of science. We take the view that such behaviour does not in general threaten the integrity of peer review or publication. The impression I got from the various people who have actual experience with the peer-review system is the same. None of this should be surprising to those paying attention as it is the same basic conclusion reached by two other independent investigations. It does mention that the scientists should have been more open, but as has been mentioned elsewhere it is the governments own polices (privatization and the desire to profit from the data collected) that impede some of the data from being released. we observed that there were important and unresolved questions that related to the availability of environmental data sets. It was pointed out that since UK government adopted a policy that resulted in charging for access to data sets collected by government agencies, other countries have followed suit impeding the flow of processed and raw data to and between researchers. This is unfortunate and seems inconsistent with policies of open access to data promoted elsewhere in government. Certainly this is the case here in Canada where some of the data that the scientists at CRU were unable to release was from Environment Canada who did not allow its release. The data is sold to those who want it. Working scientists in the Field however tend to get it for free. Perhaps governments should investigate themselves. The Muir Russel report makes it clear that CRU acted appropriately in not releasing the temperature data it had no authority to release. Shocking! Clearly had the self-proclaimed auditors wanted to they could have rolled up their sleeves and reproduced the work done by CRU and others. But that wasn’t their intent. The wanted to sow doubt. They wanted, not to examine the issue as other scientists have done, but rather to whine and complain and produce the appearance of a lack of co-operation from scientists where none existed. While this 160-page independent report should settle once and for all any lingering suspicion about the actions of the handful of scientists most frequently cited in the emails, it is unlikely to appease the conspiracy theorists who fear the U.N. is going to steal their liberties and zombify their babies under a New World Order. As with birthers and truthers and others who cling to extreme conspiracy theories in the face of overwhelming evidence, once people are lured by the fear-induced frame suggesting that dark forces are at work to control them, they apparently can’t tell reality from fiction. Even when handed a giant stack of scientific studies documenting what is known about climate change, some still deny the blatantly obvious conclusion that the world is warming, humans are driving that disruption, and we had better get cracking to confront this challenge. So what do they do? The Global Warming Policy Foundation (a think tank, whose stated goal is to oppose climate change mitigation policy) has announced that it will conduct its own investigation. Because who better to lead impartial dispassionate investigation than a think-tank who’s stated goal is anything but impartial and dispassionate. Pathetic. However despite the pathetic response from deniers there are some real criticisms of the report. For example It never really acknowledges the problem that a small research unit with, on average, less than 5 full time employees would have in finding the resources and funding to be a leader in providing open data. Never-mind responding to a flood of freedom of information requests, whole conducting the science they are paid to do. In fact one has to do 18 hours of work on each FoI request before you’re allowed to turn it down. How on earth were the scientists at CRU supposed to respond to a flood of FoI request (at their peak there was over 60 a month, and at times over 40 in just a few days). CRU was required to do the impossible. It isn’t surprising that FoI requests were not done. Also the report never looked into the organized campaign by self proclaimed auditors to spam these FoI requests. This is understandable since the organized denial campaign was outside their scope.,but there is no mention of the asymmetry of standards. If deniers were to be held to the same standards that the CRU scientists are held to they would be demolished. Their behaviour is something that should be looked at by a similar sort of investigation. But I wont hold my breath. The bottom line of the CRU email leak, is that in terms of the science behind global warming the emails are meaningless. In terms of the politics they are not, but only because deniers are twisting the emails, taking them out of context and claiming that they invalidate the science. This is denialism pure and simple. 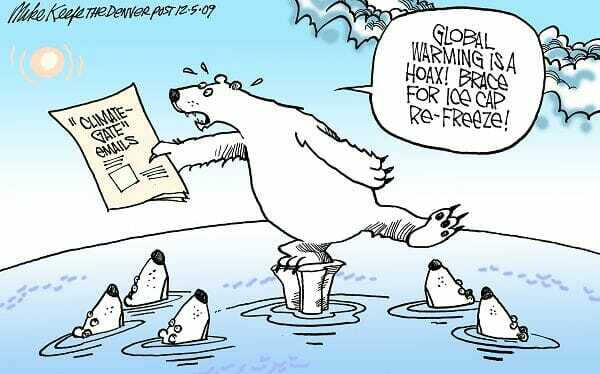 The fact that deniers have jumped all over this shows, again, their disregard for the truth. They automatically assume the worst (so obviously they are not skeptics), without any evidence to back up their extreme claims. Anyone who jumped on this has revealed their true colours. They aren’t interested in finding truth… but we already knew that. In the end this little escapade has revealed more about the deniers than about climatologists.